The European Service Module will control the Orion spacecraft's power, air and water. NASA is powering ahead with assembly of its Orion crew capsule for the first full-scale test flight of the new system, thanks to a special delivery from the European Space Agency (ESA). The European Service Module is responsible for the Orion capsule's power, air and water — and now that the first such module has arrived at NASA's Kennedy Space Center in Florida, engineers can begin connecting the assembly that will fly around the moon in 2020. NASA and the ESA engineers who traveled with the module have already confirmed the segment didn't take any damage during its journey across the Atlantic. Now, it's a matter of integrating and testing, integrating and testing, over and over again until the spacecraft is ready to fly, Mark Kirasich, NASA's Orion program manager, said during the news conference. The first connection will unite the service module and the crew module adapter, which requires precisely aligning the units and installing 192 bolts. "Alignment is a critical part of the process, it's taking a bit of time," Amy Marasia, who is overseeing the crew module assembly for the upcoming flight, said during the conference. "We're bringing together two elements that were built on different sides of the ocean so that's kind of to be expected." Next, the pair will be moved to a clean room for welding — and then to a special chamber that can be filled with helium so the team can check for leaks in those welds. The team will then install systems, like the star tracker that helps astronauts calculate their location, and make electrical connections throughout the unit. All that before they even flip the power switch, which is currently scheduled for January 2019. With the joint complete, NASA personnel will conduct thorough environmental tests on the joined modules in February and March. 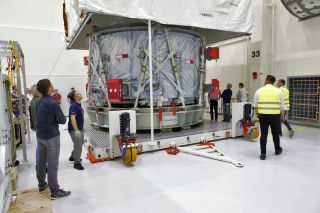 Assuming all goes well, the crew capsule itself will be connected in May, at which point the entire assembly will travel to Ohio for more than two months of additional testing. When that process is complete, the package will be shipped back to Florida for its 2020 flight. Although ESA has spent seven years designing and building this service module, it actually wouldn't be able to power a crewed flight, since it doesn't quite meet the limit NASA set for how much weight ESA could fill. That's because of how the requirements for the module have changed over the years. There's no oxygen tank in the module, for example — which is fine, without any astronauts to breathe it. ESA's next service module, which will fly on the first crewed Orion flight, will carry that tank and include other design components that weren't quite ready for this unit. "We had to go and diet, every day we had to go and diet, and, well, you know what happens with diets. … You do an effort for a few weeks and then something happens and you lose it all," Philippe Deloo, ESA's program manager for the European Service Module, said during the news conference. "We have been on a diet for about seven years."